PCWP – An inter-local agreement to proactively deal with the demands on the Papillion Creek drainage area. The City of Omaha Stormwater Program is a comprehensive program comprised of various elements and activities designed to reduce stormwater pollution to the Maximum Extent Practicable (MEP). In addition, the Stormwater Program is focused on eliminating prohibited non-stormwater discharges through a National Pollutant Discharge Elimination System (NPDES) municipal stormwater discharge permit. Green Infrastructure Basics – What is Green Infrastructure? Find A Document – Search by category or keyword. Access to all available downloads. Communities across the country are embracing Green Infrastructure as a way to naturally maintain healthy waters, provide environmental benefits and support sustainable communities. It means planting trees and restoring local waterways rather than building costly new water treatment plants. It means restoring floodplains instead of building taller levees. And it means preserving and mimicking of natural processes that slow, spread and soak rainwater where it lands. The faster water moves, the more debris it washes away, so slowing water down prevents the issues associated with erosion. When water is funneled together, such as a downspout, it gains power and can have a greater potential to erode wherever it comes out onto the ground. Spreading it out reduces that power. Buildings and pavement prevent water from soaking into the ground. Measures can be taken to create surfaces that are more conducive to ground penetration, which allows stormwater to reach plants, grasses, and trees. We have developed a very informative manual for homeowners, the Sustainable Landscapes Manual, to help with building the best and most sustainable gardens possible. The manual is free to download and is listed below. In the back of the manual is a full plant list to help you pick the right plant for the right place. The plant database is also available online at omahaplants.org! This online database allows you to sort, view, and share all the plants you want and create your own planting list! Download the fact sheets below to learn how to incorporate green infrastructure in both residential and commercial spaces. 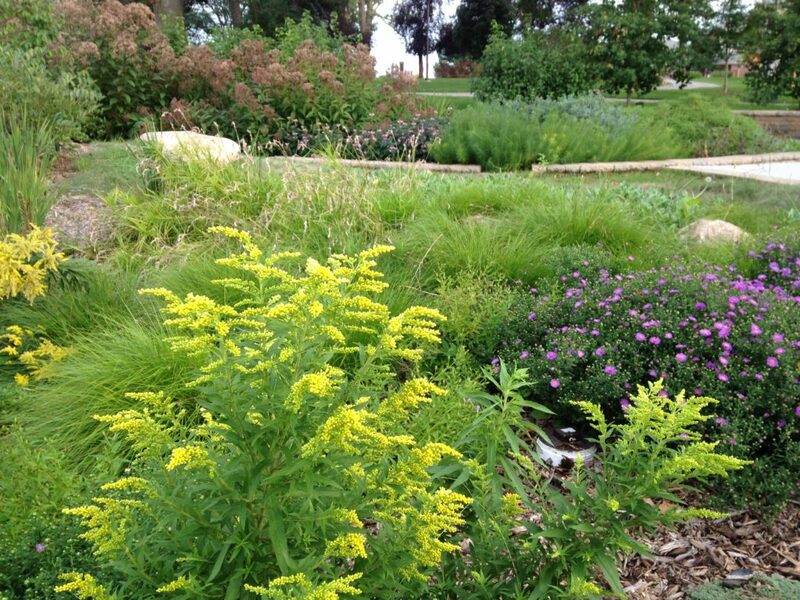 To see green infrastructure projects across Omaha, visit our Green Infrastructure page! Funded by the Nebraska Department of Environmental Quality. Copyright 2019. All Right Reserved.